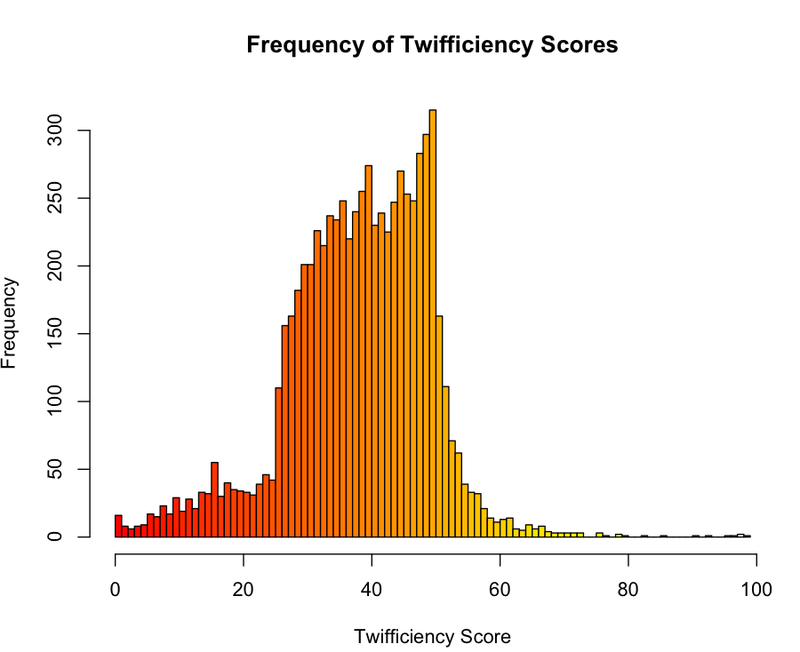 And what the heck is twifficiency anyway?! 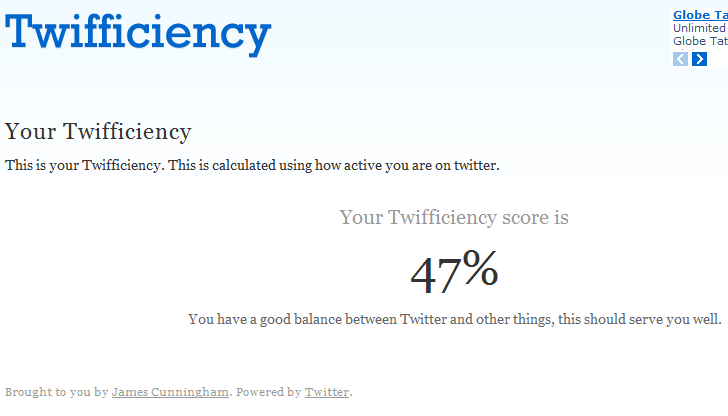 In a nut shell, Twifficiency calculates your twitter efficiency based upon your twitter activity. This includes how many people you follow, how many people follow you, how often you tweet and how many tweets you read. So basically, twifficiency is the score of your twitter account's effectiveness (of course in a matter of communication). As you can see from the definition, the considerations for this score are: number of people you follow, number of people who follow you, number of tweets you post and number of tweets you read which simply means the number of activity you do and the interaction you've made and the other poeple/follower interaction with your tweet. agree? But I also think that somehow, retweets of your posts, or replies to your tweets can also affect the score. 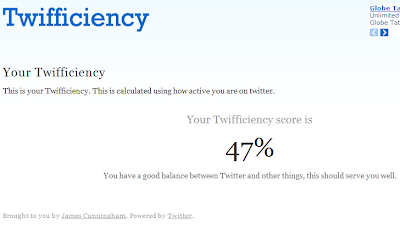 I think its safe to assume that balance is the secret for high twifficiency, you will have lower twifficiency if you follow to many people but only few follow you, or you have too many followers but is not following anyone (which equates to lessers chances for good reads from other poeple.). Same applies to tweets, you might be sending too many tweets but are other people interested on those? If poeple are interested, there is a high chance that they will reply to your tweet or even retweet your post to their followers. scores range from 0-99. I think I remember @jamescun mentioning the max score is %100, I haven’t seen it yet. The mean Twifficiency score is 38.5285 and the standard deviation is 11.1036. The score at the 25th percentile is 32, the median score is 39, and the score at the 75th percentile is 47. I'm glad my score is more than the median. Do you agree with my assumptions? Post your thoughts on the comments section.